QB Corporation is essentially two mills in one with the addition of the new laminating facility recently constructed on the south end of the existing plant. This new plant includes state of the art equipment from the lumber grading station through the finish room. We now have two working high production lines along with two curve lines. With the addition of the new facility, customers can expect more versatility and shorter lead times due to the increased capacity. The addition of the new glue racks and bigger curve floor allows us the ability to glue longer and heavier cambered beams. We now have a second beam press in operation to cover all of your stock needs. If you are looking for that cleaner beam look, try our “clear glue” option that makes the glue lines virtually invisible. The new finish line has the ability to finish any size beam (see capabilities) we produce. We can also load the trucks indoors. Note the 96 footers that are rolling out the door in the photo. QB Corporation is situated on 45 acres of land or 182,000 square meters. The manufacturing facility, including the pre-grade and sort area, has approximately 175,000 square feet of manufacturing space. QB has multiple lines capable of producing the most versatile product range offered in the industry. Custom, curves and tapers as well as production stock beams are all efficiently produced in our state of the art facility. The plant is capable of producing beams up to 20″ wide, 108″ deep and 130′ long. 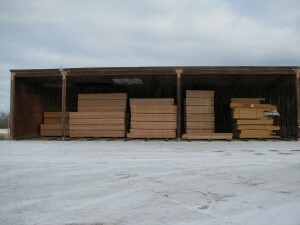 Right at the start, lumber is protected from excessive moisture in our storage sheds. RF (Radio Frequency) batch press that cures glulam beams as they pass through the press. When completed the glulam beam is moved to the finish department. The automated finish department is capable of processing the many varied products demanded by our customers. The beams are then wrapped and stacked for shipment. We take great care to secure and protect your order to ensure your beams are in the best physical condition when you receive them. 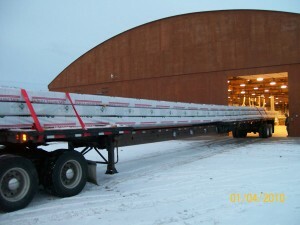 Beams are loaded on trucks for delivery to jobsite or lumber yard.